Kent Lambert represents Colorado State Senate District 9 which includes: Northern Colorado Springs, Air Force Academy, and Black Forest. 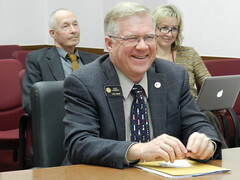 Senator Kent Lambert represents Colorado State Senate District 9 which includes: Northern Colorado Springs, Air Force Academy, Monument and Black Forest. Senator Kent Lambert retired from the United States Air Force in 2004 as a colonel. His varied career included tours as a B-52 pilot; a senior scientific analyst in the Pentagon; the air and defense attaché in Jordan and Sweden; the Deputy Defense Intelligence Officer for Europe in the Defense Intelligence Agency; and the Deputy Director of the Air Force Space Command Space Analysis Division. Following his retirement from the Air Force, Senator Lambert continued his dedication to service by running for the Colorado legislature where he served several terms before moving on to represent Senate District 9. He was also instrumental in forming and organizing the Republican Study Committee of Colorado, where he served as the Executive Director and Chairman. In that capacity, he provided direct support to a broad range of Republican legislative activities. Senator Lambert is concerned with aligning Colorado with upcoming changes on the federal level. He is an avid supporter of decreasing harmful regulations that deter businesses from locating to Colorado, and works tirelessly to cut wasteful spending and advocate for tax payers by prioritizing funding to our state’s most vulnerable areas.